The DoC web site has information about the track. However, the expected time of 2 hours in each direction does not agree with the DoC panels along the track, and the actual walking time was about 2 hours 15 minutes without any breaks. 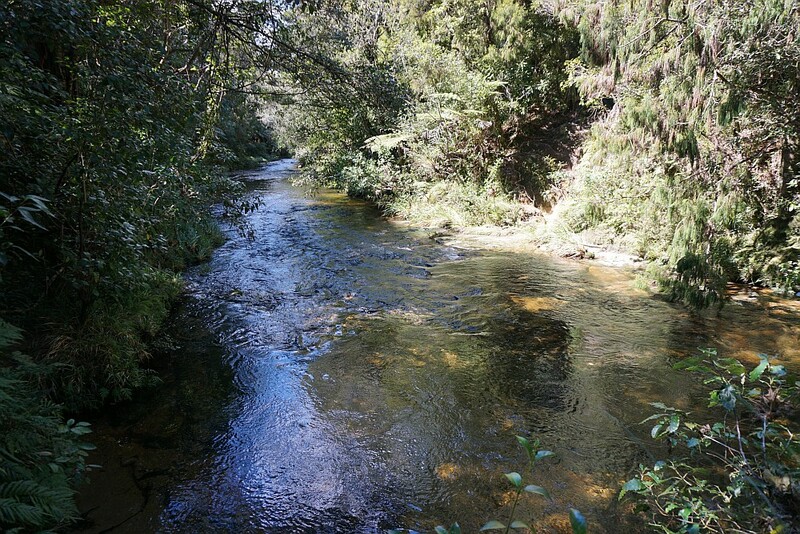 One of the few tracks where the actual walking time was longer than the DoC posted time.The track has one river crossing which can be difficult to do without getting wet feet, and several easier stream crossings. To start and end at Whakamarama Road there are two options. The first and shortest is to return along the tramline. 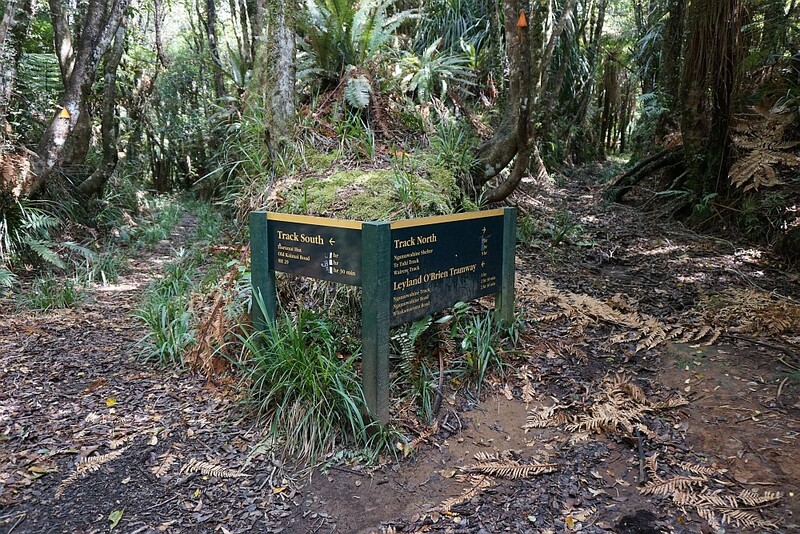 The second is to take the North / South Track north to Ngamarama Track, and then return to Whakamarama Road on the Ngamarama Track. 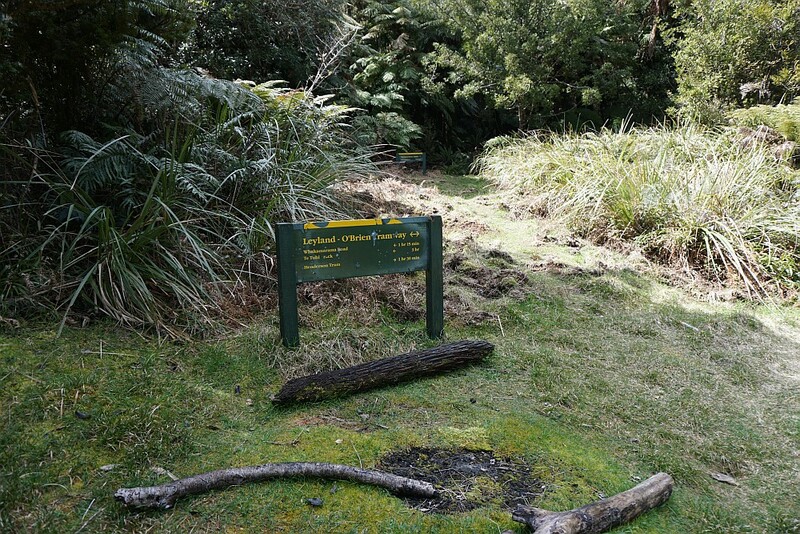 This walk was done in both directions on the Leyland O’Brien Tramway Track. 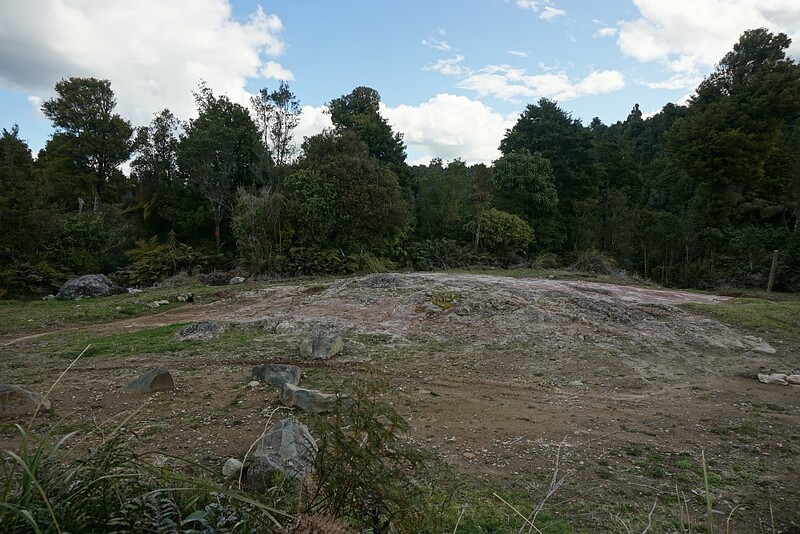 There is a basic DoC toilet by the parking area at the end of Whakamarama Road, but no signs to indicate where the tracks start. So this walk started out taking the wrong track, which ended up on the correct track after about 500m on a well used but unmarked track. 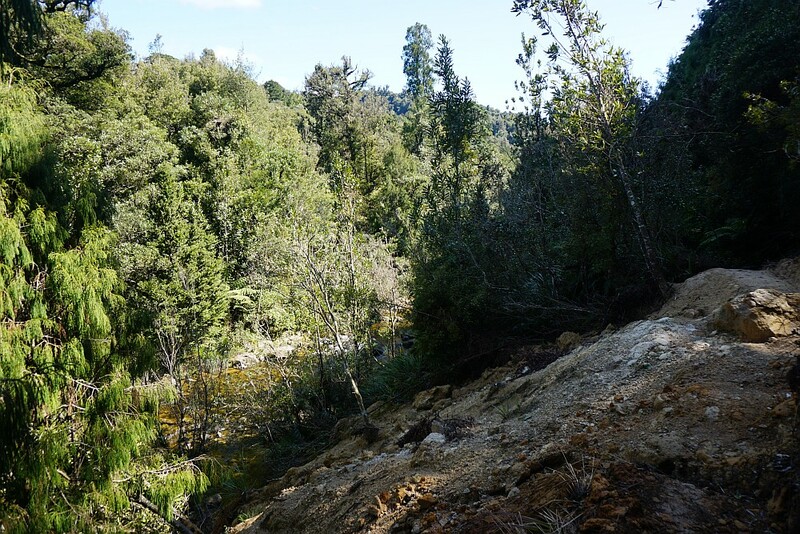 Shortly after meeting with the Ngamuwahine Track there was a fallen tree which completely covered the track, and it was not obvious where the track continued. So time was spent trying to find the actual track again, as there were no markers in place. Total time for the walk was close to 5 hours, including a short break for lunch, and time spent searching for the correct route on the outbound leg. Total distance according to DoC should be 6.3 km each way, but measured distance by GPS was close to 6.7 km. 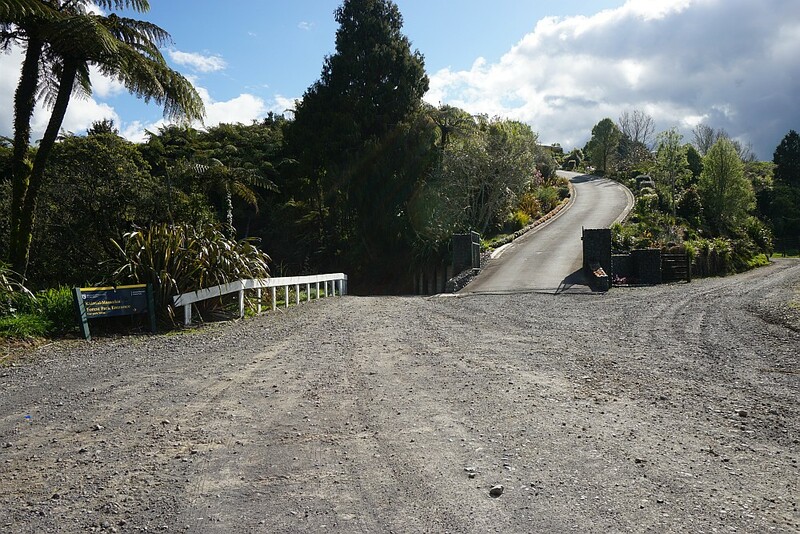 Whakamarama Road continues alongside the railing to the left of centre for another 500m or so along a single lane winding gravel road to a parking area. 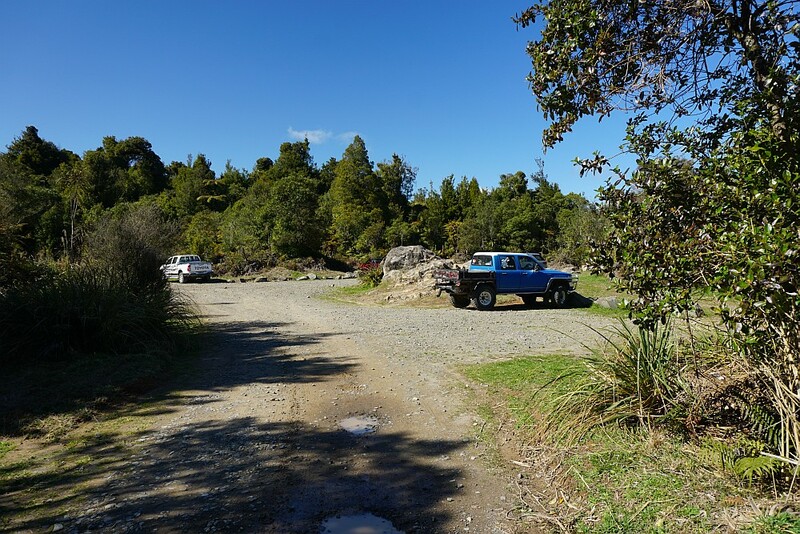 The parking area at the end of Whakamarama Road. The DoC toilet is at the far right, with the wrong track, which does lead to the Leyland O’Brien Tramway Track, starting on the far left. It’s not obvious at the parking area where the various tracks start. 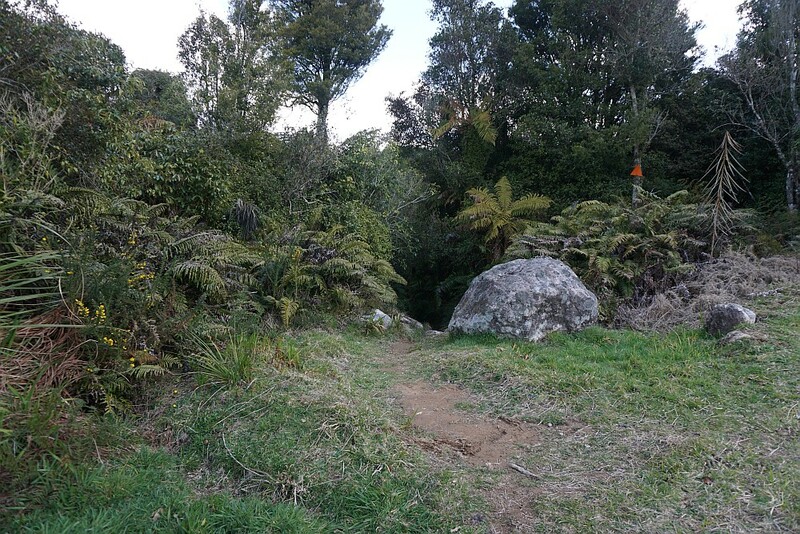 The shortest entry to the Leyland O’Brien Tramway Track is by the rock on the far left. It’s possible that the track starting by the post on the far right also leads there, but that wasn’t explored on this walk. 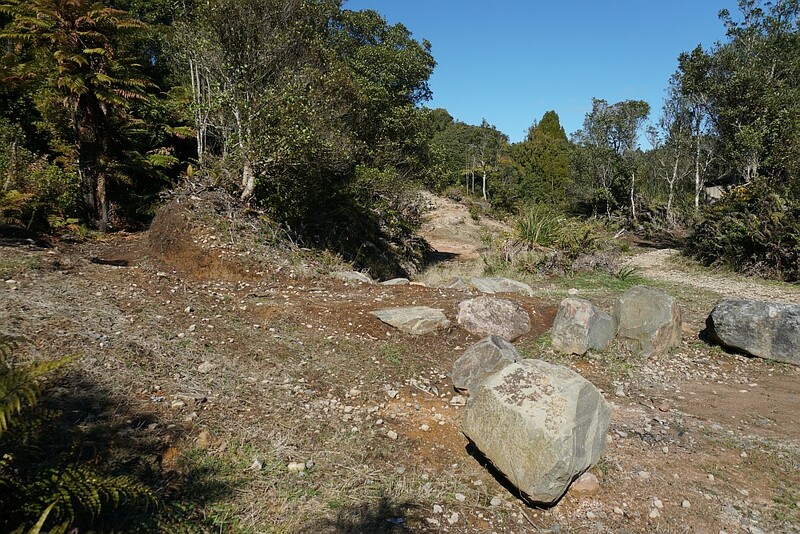 The start of the Leyland O’Brien Tramway Track by the parking area at the end of Whakamarama Road. The DoC track marker is about 140m down this track. 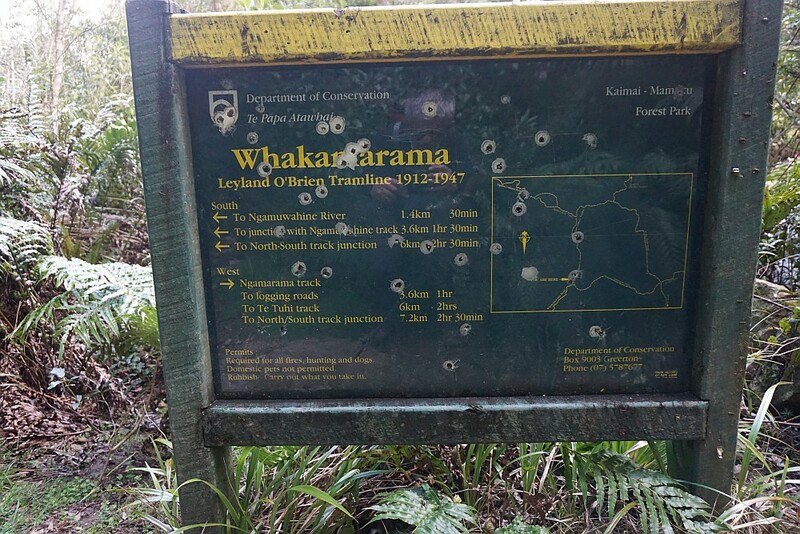 It seems that some firearms users have nothing better to do than to destroy information panels that are set up for their use, as well as those who wish to walk on the tracks and get some information about them. This panel is about 140m from the parking area. The time on here is shown as 2 hours 30 minutes to the junction with North / South Track. Most of the track is easy to walk, with only gentle rises and falls except at the stream crossings and valleys where bridges supporting the tramline have long since disappeared. 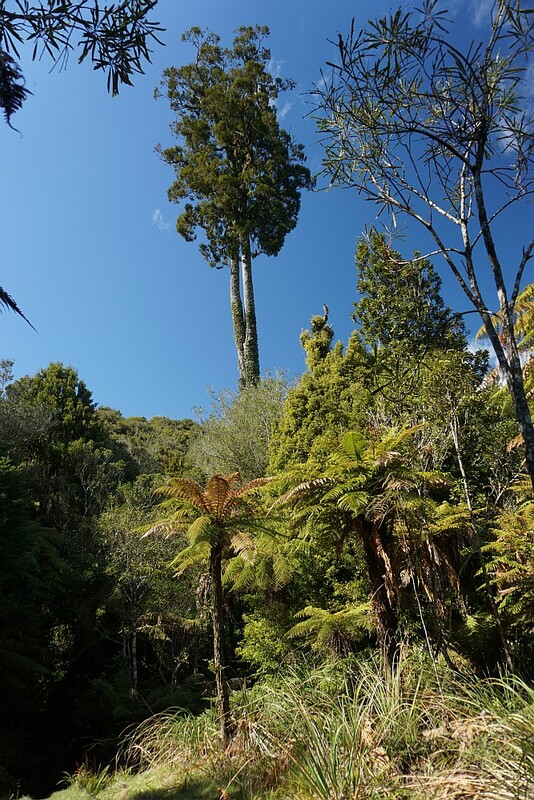 Most is also under cover of regenerating native forest. 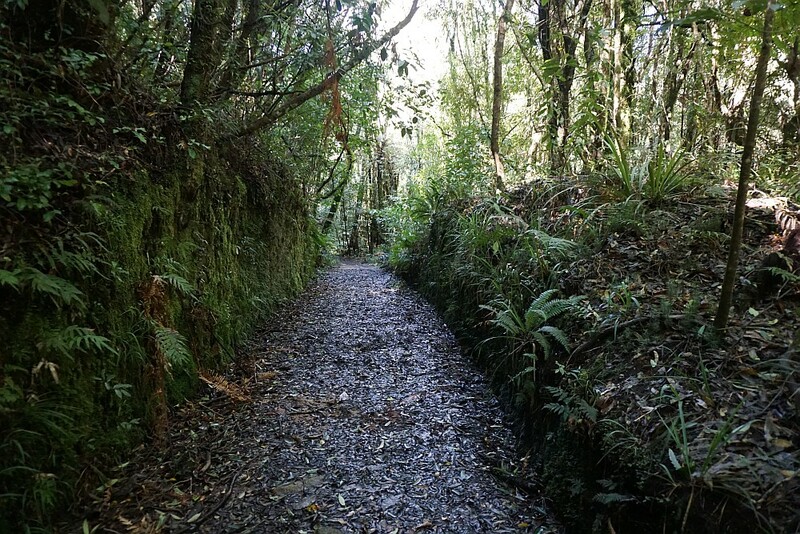 The northern end of the track follows the Ngamuwahine Stream, which can be heard and occasionally seen from the track. This slip across the track left a clearer view of the stream below to the left. One of the few large trees which for some reason escaped being felled when the original forest cover was cleared and extracted along the tramline. 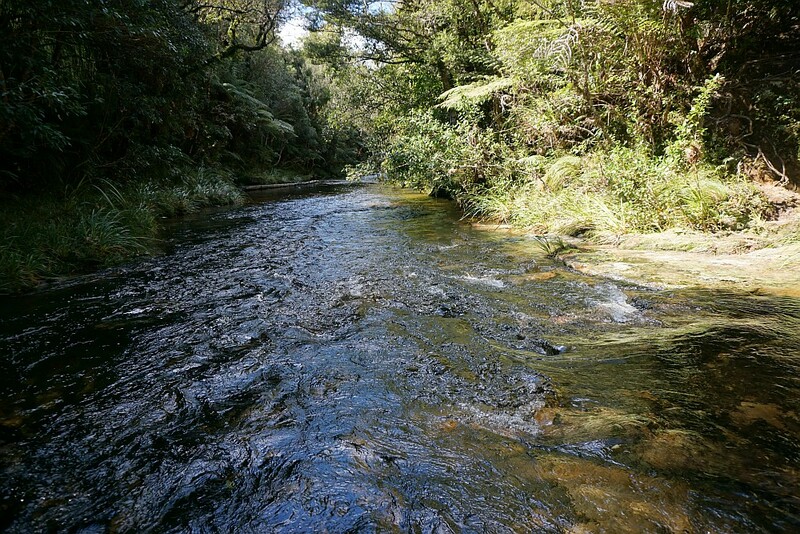 The Ngamuwahine Stream seen from the track. The signage for the river crossing has mostly disappeared. The track continues on the opposite side of the stream, just right of centre. 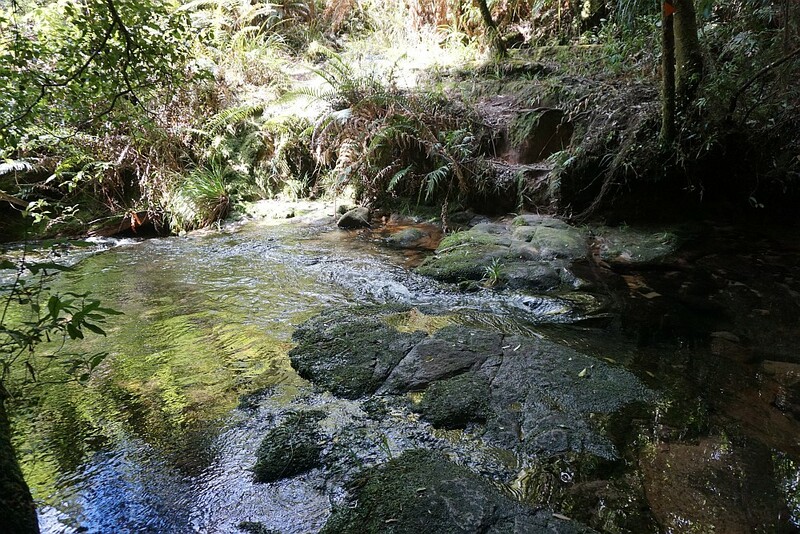 To avoid walking with wet boots and socks it was a barefoot stream crossing, in cold water, with slippery rocks. 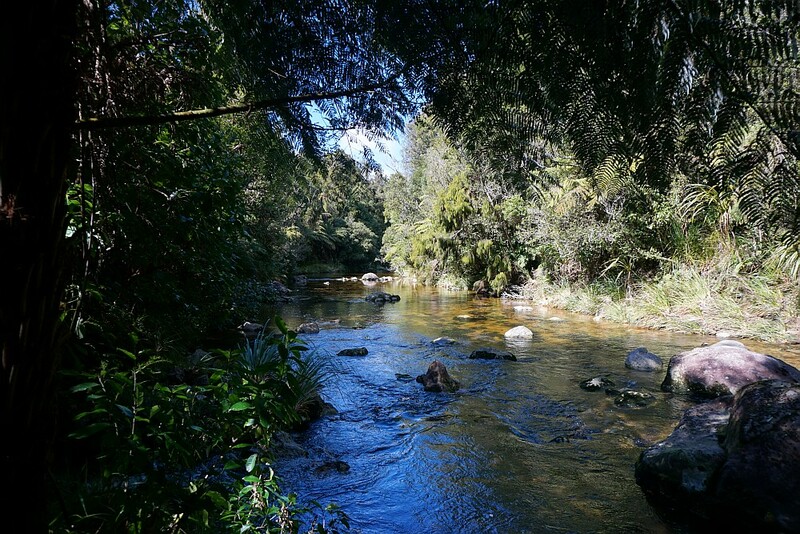 View from the middle of the stream, both upstream and downstream. 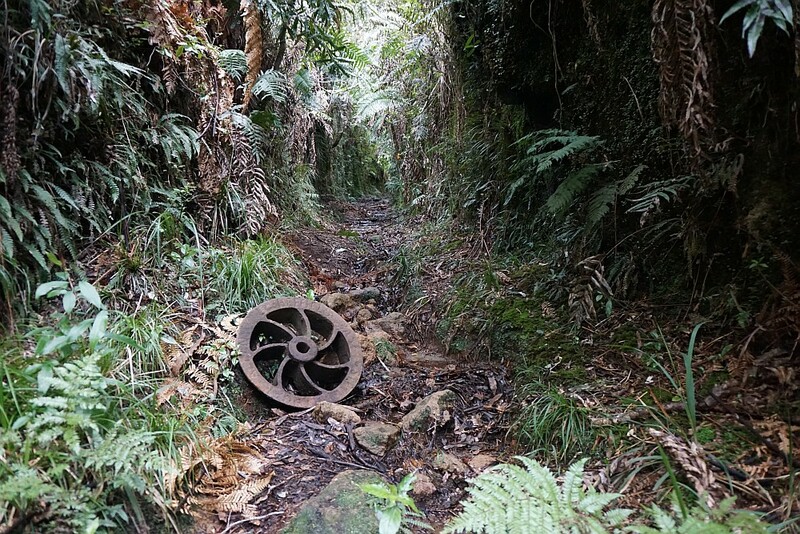 Remains from the original tramway can be found along the track. There are bearers which supported the sleepers, and also remains of the sleepers can be seen in several locations. 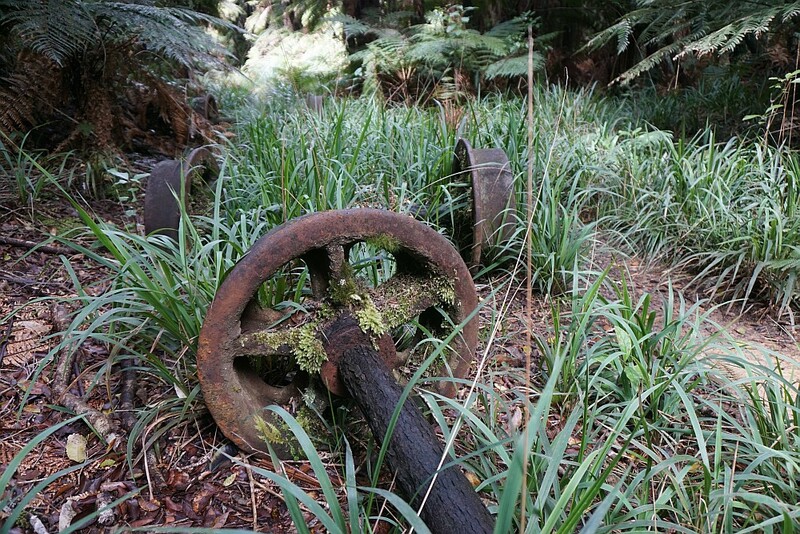 Also a few wheels from the trolleys used for log extraction. 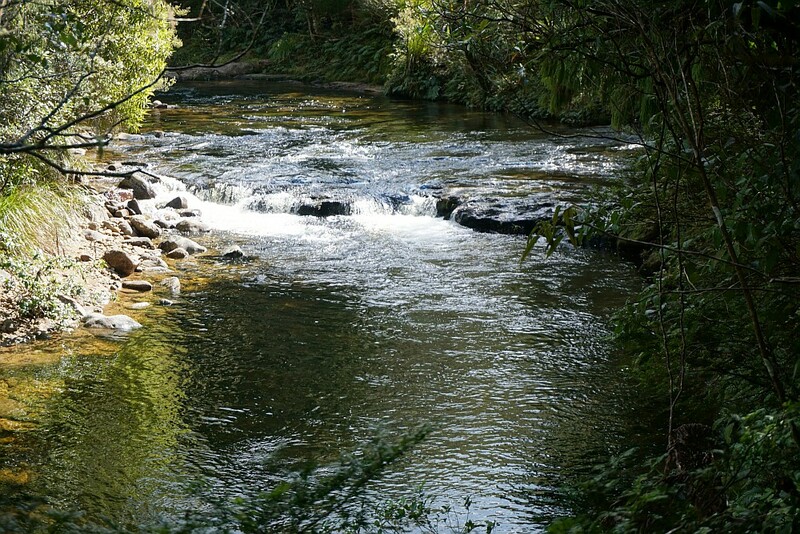 Most of the stream crossings can easily be crossed on well-placed rocks or logs. 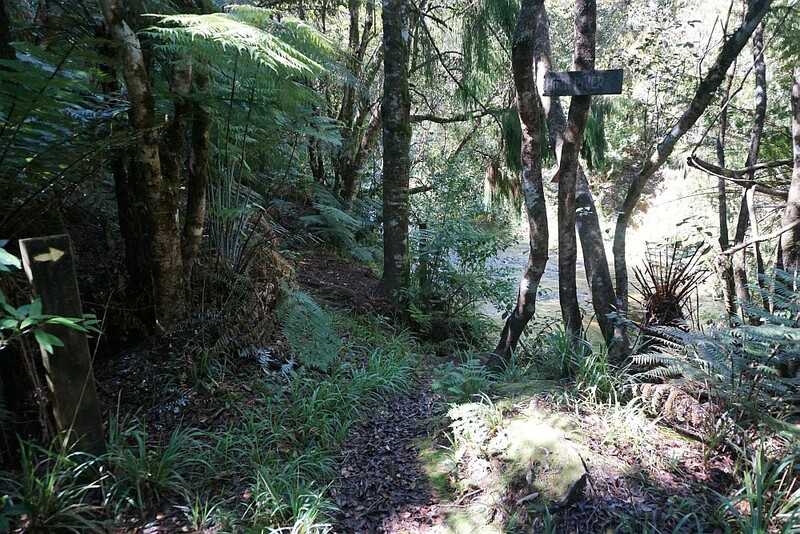 The junction with Ngamuwahine Track. 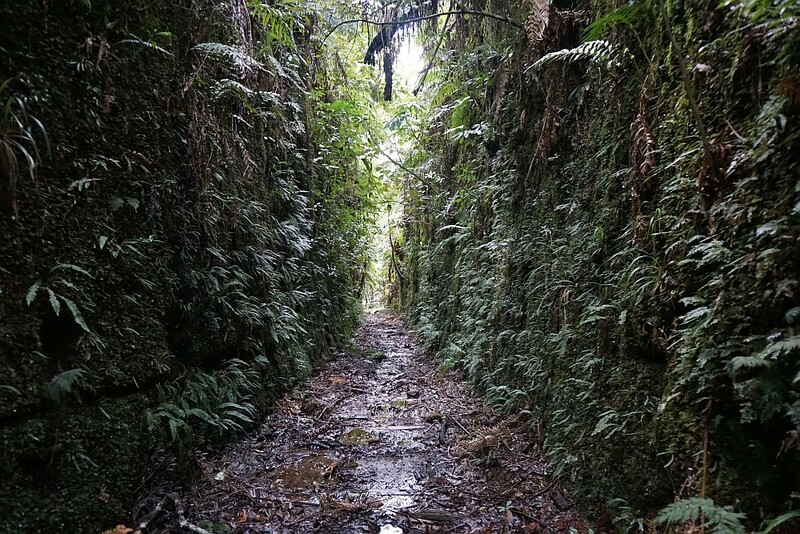 The deepest of the cuttings and also one of the steepest sections of the tramway. The junction with North / South Track, and the southern end of the Leyland O’Brien Tramway Track. Apparently there was a fork in the tramway, separating it into two parts which continued along the left and the right branches for some distance. Another view of the river on the return leg. 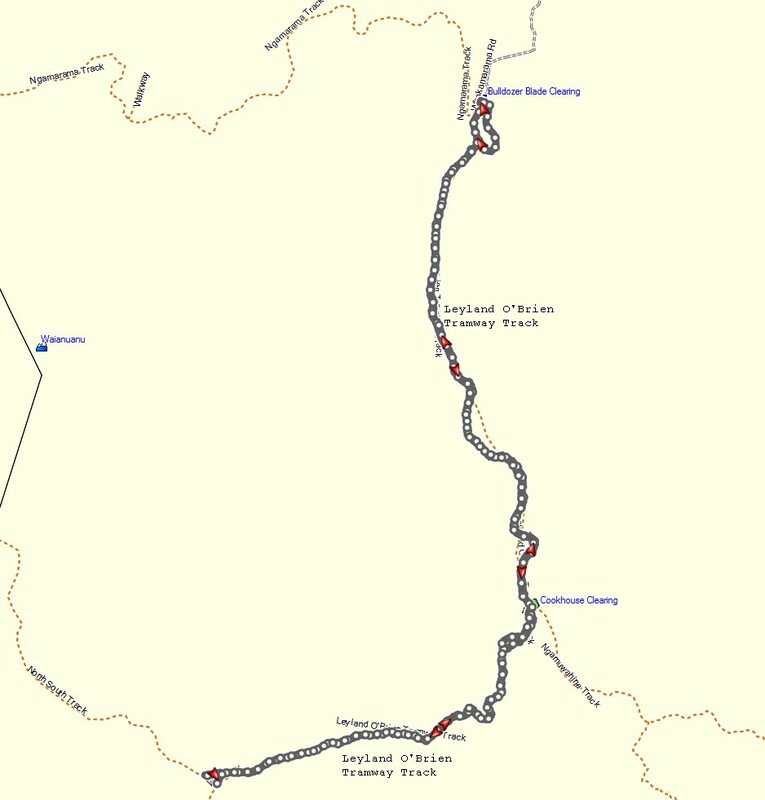 The GPS track log shows the route walked, starting and ending at the Bulldozer Blade Clearing (the parking area at the end of Whakamarama Road). 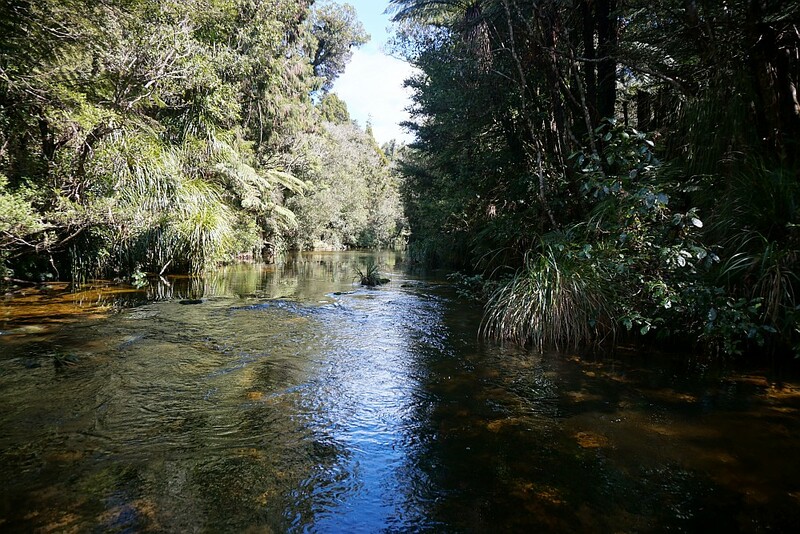 The river crossing is about 400m north of the junction with Ngamuwahine Track (shown as Cookhouse Clearing). Total time was just under 5 hours, including a short lunch break, and time spent searching for the correct route in two places. Total distance just over 14km. On the return leg the time from North / South Track to the junction with Ngamuwahine Road was 55 minutes and the distance 2.9 km. From the junction with Ngamuwahine Road to Whakamarama Road the time was 1 hour 15 minutes, and the distance 3.8 km. The track was walked on September 26, 2015.